It was little more than three miles from the Wall into the Old Kingdom, but that was enough. Sabriel grows up in Ancielstierre, in a boarding school close to the Wall. When the wind blows from the Old Kingdom beyond the Wall, technology stops working and strange things walk the night. Things that should be dead. Her father is the Abhorsen and he sends the Dead back to Death. When he sends her his swords and bells, Sabriel knows something is terribly wrong. She will have to cross into the Old Kingdom to find her father – and battle the rising Dead on the way there. I loved this book. The characters, the world, the magic and the language were amazing. The language was the first thing you notice. There are many on point descriptions that immediately create the right atmosphere and vivid pictures. The man strode towards the bodies and looked upon them. Then he turned to face the watchers, pushing his hood back to reveal the face of someone who had taken oaths far from sunlight, for his skin was a deathly white. The worldbuilding was amazing as well. First, because it was coherent and some thought was put into it. Second, because it was different. We have Ancielsterre, with technology emerging, the first cars driving around, tanks being built. And then there is the Old Kingdom, where technology doesn’t work, but magic does. In the Old Kingdom, the border between life and death is thin and something with enough willpower can get back to Life. Anything powerful enough to cross the Wall usually retained enough magic to assume the shape of a soldier; or to become invisible and simply go where it willed, regardless of barbed wire, bullets, hand grenades and mortar bombs – which often didn’t work at all, particularly when the wind was blowing from the north, out of the Old Kingdom. I loved the magic. On the one hand, we have Charter Magic, that is more in the traditional vein of magic. What really made this book different was the necromancy, specifically, the bells Sabriel can use to summon the Dead or send them back. “Ranna,” she said aloud, touching the first, the smallest bell. Ranna the sleepbringer, the sweet, low sound that brought silence in its wake. I loved the way music and magic are combined in the book. 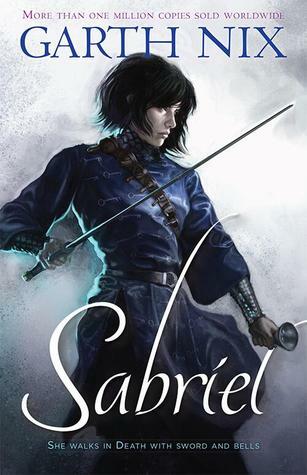 Sabriel was a very strong character. She goes back to the Old Kingdom to save her father. On the way, she encounters terrible dead enemies, but she doesn’t let them stop them. At the same time, she is allowed moments of weakness and fear. It made her a well-rounded, convincing character. The only flaws of the book were the love story and the ending. The romance felt too rushed. There wasn’t much built-up and it wasn’t subtle. I also wish the ending felt less deus ex machina. There was all this built-up, with the atmosphere getting darker and darker and then the actual showdown… was not very exciting. It felt too flat and rushed, with characters appearing out of nowhere and things happening too suddenly. Wonderful world with a different, interesting magic system and an amazing protagonist.